A peerless practitioner of lethal shadow magic, Shieda Kayn battles to achieve his true destiny—to one day lead the Order of the Shadow into a new era of Ionian supremacy. He audaciously wields the sentient darkin weapon Rhaast, undeterred by its creeping corruption of his body and mind. 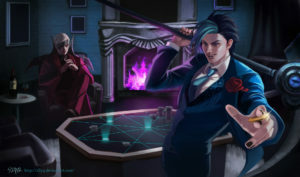 There are only two possible outcomes: either Kayn bends the weapon to his will… or the malevolent blade consumes him completely, paving the way for the destruction of all Runeterra. Noxian by birth, Kayn and others like him were conscripted as child soldiers, a cruel practice employed by only the most devious commanders of the empire. Ionian compassion was a weakness to be exploited—their warriors would hesitate before striking down a supposed innocent. 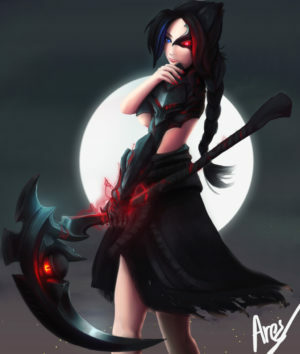 Thus, barely able to lift the blade he had been given, Kayn’s first day in battle was also expected to be his last. The Noxian forces landed at the mouth of the Epool River. Kayn and the others were a reluctant vanguard, facing disorganized bands of locals defending their home from these returning invaders. 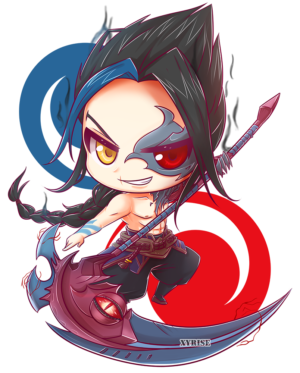 While his young comrades were cut down or fled the battlefield, Kayn showed no fear. He dropped his heavy sword and snatched up a fallen sickle, turning to face the shocked Ionians just as the Noxian regulars swept in from the flank. The carnage was staggering. Farmers, hunters—even a handful of vastaya—all were butchered without ceremony. Two days later, after word had spread throughout the southern territories, the Order of the Shadow came upon the grisly scene. Their leader, Zed, knew this area had no tactical significance. This massacre was intended as a message. Noxus would show no mercy. A flickering glint of steel caught his eye. A child of no more than ten lay in the mud, leveling his broken sickle at the master assassin, bloody knuckles straining white. The boy’s eyes harbored a pain that belied his age, yet still burned with all the fury of a hardened warrior. This tenacity was not something that could be taught. Zed saw in this child, this abandoned Noxian survivor, a weapon that could be turned against those who had sent him here to die. The assassin held out his hand and welcomed Kayn into the Order of the Shadow. Acolytes traditionally spent years training with a single weapon of their choosing, but Kayn mastered them all—to him, they were mere tools, and he was the weapon. Armor he viewed as a cumbersome burden, instead cloaking himself in shadows and slaying his enemies with quickness and stealth. These swift executions instilled fear in the hearts of those fortunate enough to be spared. 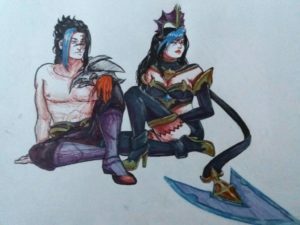 And as Kayn’s legend grew, so did his arrogance. He truly believed that one day his power would eclipse even that of Zed himself. 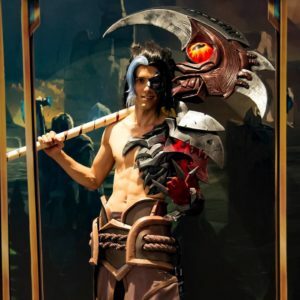 This hubris led Kayn to embrace his final test: to seek out a darkin weapon recently unearthed in Noxus, and prevent it being used against the weary defenders of Ionia. He accepted without hesitation, never questioning why he had been chosen for this task. Indeed, where any other acolyte would have destroyed the living scythe known as Rhaast, Kayn took it for himself. The corruption took hold the moment his fingers closed around the weapon, locking them both in a fateful struggle. 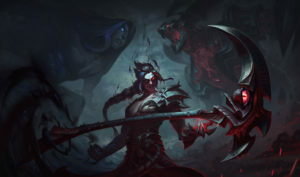 Rhaast has long awaited the perfect host in order to join its darkin brethren and lay waste to the world, but Kayn will not be easily dominated. He returns to Ionia in triumph, convinced that Zed will name him the new leader of the Order of the Shadow.